3 batters into the game, the Mets had Granderson on third & Cabrera on second, Cespedes would line a shot over the center field wall to bring in 3 runs. It would count as Cespedes’ 2nd home run of the season. 2 batters later, Neil Walker would hit a 2-strike single out to right center field. Duda followed with his own single which snuck past a diving Hernandez at second base. Reyes then swung at the first pitch, flying out to left field starting out the season going an abysmal 1-28. Harvey went out in the bottom of the first & struck out Cesar Hernandez to start his evening. He struck out Odubel Herrera to end the inning & worked very efficiently as it took him 11 pitches to put down the Phillies. With one out in second, Granderson flew out to center field however Herrera lost the ball in the sky almost immediately. Cabrera then followed with a single of his own, going 8-16 against Phillies veteran Clay Buchholz. Cespedes then fouled out to the catcher Rupp but while no one on the Phillies was paying attention, Cabrera tagged up & advanced himself to second, setting runners up on second & third for the smoking hot Bruce who just came off of a two home run game. Jay Bruce continued his hot streak as he lined a single over the second baseman’s head while playing deep in the shift scoring both Granderson & Cabrera with a play at the plate to no avail. Walker the grounded out to second but not before the Mets raised the lead to 5-0 in Philadelphia. However, Phillies up & coming third baseman Mikail Franco would lead the second inning off with shot to left to put the Phillies on the board & cutting their deficit by four runs. Hopefully Reyes began to show signs of life & breaking out of his slump after he hit a 1-out double down the right field line, putting him in scoring position. Buchholz ran the count full to d’Arnaud before catcher Cameron Rupp signaled for the dugout & the medical staff. He would end up exiting the game with an apparent injury to his throwing arm & only threw 2.1 innings while having a tough go from the start, giving up 5 runs in that span. Lefty Adam Morgan replaced Buchholz while inheriting a runner & a 3-2 count. d’Arnaud would immediately line a single up the middle to bring Jose Reyes in to score. The Mets would again take the lead by 5 runs before Morgan would eventually put an end to the inning. Cabrera picked up his third hit of the game in a pretty powerful fashion. He would end up taking Morgan deep over the left center field wall, for his first home run of the year. However, with Cespedes next up to bat, he couldn’t let himself be out performed by his friend at the shortstop position. So Cespedes would line a bullet just inside the foul pole to give the Mets the 7 run lead on Cespedes’ second home run & fourth RBI’s of the game. The Philles started the bottom of the fourth out with back to back singles off of the Mets “Dark Knight” Matt Harvey. But Franco, who already had a homer, flew out to Granderson in center allowing Howie Kendrick to advance to third with just one out. The Phillies would then score a run on a fielders choice that was really close to being a 3-6-1 double play. But Harvey would get out of the inning, only giving up one run. The Mets now held the lead at 8-2. 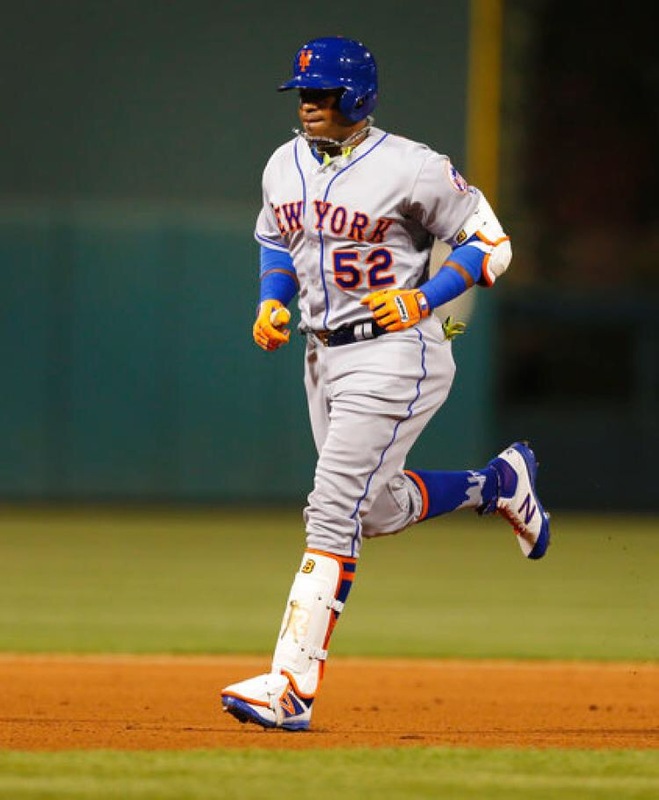 With 2 outs in the 5th, Cespedes showed no signs of slowing down as he hit his third home run of the game as well as driving in his 5th RBI as well. 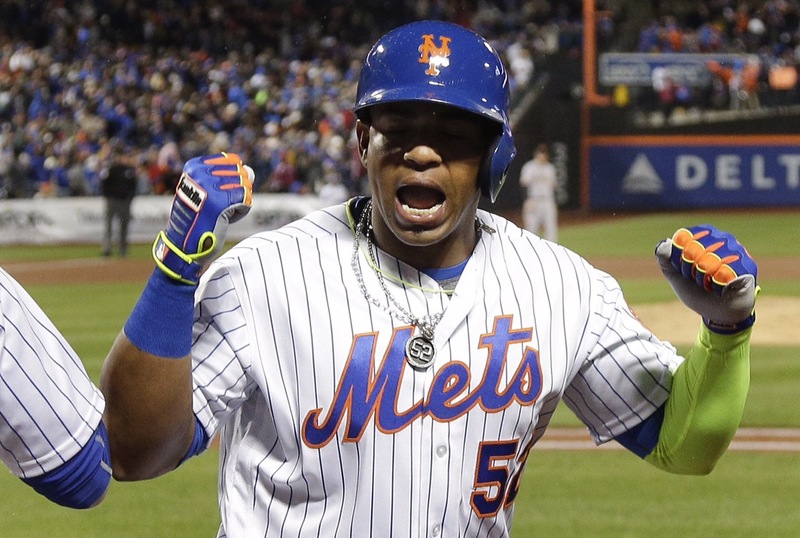 Like Darling was mentioning on air with SNY, Cespedes might have the best bat speed in the NL. The home run get the Mets a seven run lead going into the bottom of the 5th. Cespedes didn’t stop there. With two outs in the top half of the seventh, Cespedes laced a line drive over the head of Odubel Herrera for a double & his fourth extra hit of the game to go alone side his 3 HR’s & 5 RBI’s. However, the Phillies were able to escape the inning with no damage. After the Phillies got 2 relatively quick out in the 8th, Travis d’Arnaud would end up going opposite field for a 2-run home run, counting as the Mets 6 home runs against Philadelphia that night. Cabrera would drive in a run on a single lined out to left later that inning. The Phillies would make the move to the pen to bring in a right handed pitcher Jeanmar Gomez to face the Mets superstar slugger Yoenis Cespedes. The move would pan out for the Phillies as Cespedes hit a laser that short hopped the shortstop Freddy Galvis to put an end to the top of the 8th. Smoker would come into the game in the 8th & give up back to back double to make it a 13-3 game but more importantly it raised Smoker’s ERA & opponents batting average. Luckily, he would next get Herrera to ground out for the first out. He then was able to get slugger Mikail Franco to ground out while driving in a run & making it a 13-4 game before Smoker would bring the inning to an end. Harvey would end up going 5.2 innings while giving up five hits & one walk & allowing two earned runs to score. He also gave up one home run to Mikail Franco while striking out 6 Phillies along the way & earning his second victory on the young season.